It might seem strange to many who live in Austin to be considering flu season, but even though the thermometer has barely moved off of 90 all summer, we are nearing the start of fall! The cool weather is in sight! Cue deep sighs of relief. With September sneaking around the corner, flu season has officially begun. At Downtown Doctor, we received our first shipment of flu vaccines just this week, and are ready to hand them out! Now, it seems to be a pretty common occurrence for everyone to give the same responses as to why they just simply cannot get a flu vaccine this year. Maybe you’ve heard a story from that pesky coworker about how they were ravaged and bedridden for weeeeeks with sickness after their shot. Or how your Aunt Edna got one last year and still got sick, because, dagnabbit, they just don’t work. Well, that’s simply just false. And let us tell you why. Flu Myth #1 - The flu shot makes me sick. This is the most common excuse as to why someone tells us that they do not want the flu shot. Influenza is a virus — a sneaky, cell-hacking, little virus that works its way through your system, manipulating your body’s own cells to produce more of the virus. The result? Taking the day off work to spend it on the couch with your friends Day-Quil and Kleenez while you watch reruns of the Golden Girls. The flu vaccine is a dead virus. Dead, according to Webster’s Dictionary, means not-living, inactivated, incapable of motion. Therefore, this particular virus will not be able to perform any of the above-mentioned sneaky and evil behaviors. Your body, however, is able to recognize the virus as a foreign cell and destroys it. In doing so, it makes “memory” cells, which, when your body is later exposed to the same virus, can immediately mount an attack and destroy any pesky invaders. You will not get sick. Watching Golden Girls, however, is completely optional. 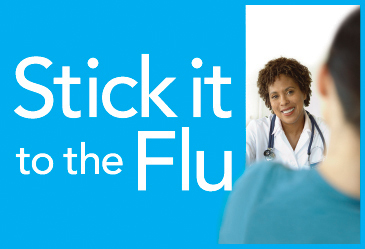 Flu Myth #2 – I always get the flu, no matter if I got the shot. Each year, the CDC spends hundreds of hours researching which flu strains will most likely be in circulation for the upcoming flu season. While we can never be 100% certain, in the past 18 of 22 flu seasons, the CDC reports that the flu vaccine has been highly matched with the strains. The flu shot is also made up of three variations of influenza, which helps to target even more strains of the flu. In addition, even if you find yourself mysteriously infected with a wild rare strain of influenza that you contracted from your dog (Don’t listen to your Aunt Edna, this never happens! ), the vaccine helps to provide additional support to your immune system. I bought a dress last year, too, but alas, it no longer fits (What can I say? I like jelly donuts). Just like that dress, the flu vaccine you had last year no longer “fits” the current influenza profile. Viruses, in their ever-sneaky way, are constantly changing. Due to this, the flu shot changes each year, which is why it is important to make sure that you get a new flu shot each year as well. The vaccine that you had from a previous year, however, doesn’t just disappear. It can help to provide additional protection to you in flu season this year. Flu Myth #4 – I’m too old for the flu shot. You are never too old! How do you think Betty White is still kicking? She’s been getting her flu shot! In fact, 90% of influenza-related deaths are people 65 and older. Save Aunt Edna. Make her get a flu shot this year. Flu Myth #5 & #6 – I’m too busy to get the shot. It’s too expensive. However, the flu shot shouldn’t be one of them. At Downtown Doctor, you can make an appointment at any time (whether you are a new patient or not!) or just walk-in to our beautiful, spa-like clinic on 5th St! The choice is yours. We promise to have you in and out, with little to no wait. Any one of our staff members are trained to administer the flu shot to you — quickly and painlessly. And the cost is only $25! So stop in soon! We’re sure that you will love us.